Gentle, cautious footfalls avoided a tumble. A lone rabbit track teased, emerging from under a stump, then rounding a bushy cedar tree. My winter moccasins shuffled in a joyous, yet measured pursuit. The track angled downhill, straight at a toppled cedar tree. My thumb fidgeted on “Old Turkey Feathers’” hammer, then pressed firm on the jaw screw’s crown. After three side steps to the east, I paused. The air smelled of red cedar as my eyes searched the damp snow around the windfall, hoping the track ended under that tree. Faint depressions said not; the cottontail continued west. Falling ice crystals began striking the cedars’ magenta boughs; some popped on the grove’s white carpet. Raindrops tickled my cheeks; small drips splashed on the browned barrel’s flats. The distinctive footprints entered a shallow ravine, and on the far side, joined with a myriad of others under the cedar trees that lined the gully’s bank. My moccasins circled south, in part to avoid the steep slope, but more in search of another single set of tracks leaving the area. In a few minutes I happened upon a beat-down rabbit trail, the kind I hadn’t seen in years. This little trace crossed a wagon path and fanned out in the next group of cedar trees. The sky grayed more and the shadows grew darker. Dozens of rabbit tracks beat down the snow beneath each tree; round, brown droppings littered the ground, along with green, clipped bough tips. I stood for a while, visually checking the base of each tree for a resting cottontail, but to no avail. I struck off to the south until the tracks thinned. At the edge of a clearing I found a pair of tracks, one heading south and one returning. Or was it the other way around? That afternoon’s course turned west as an occasional snowflake mixed with the ice and rain. My moccasins stitched in and out of the second cedar grove, but the abundance of tracks persisted, distributed evenly under each cedar tree. The tracks crossed the clearing, veered through some cedar trees, then parted where the red oaks start on a gradual side hill. Here too, a rabbit, or rabbits, tramped down the snow around the tree trunks and left ample droppings. A tangle of barberries grew a dozen paces distant from where I stood. In the midst of the prickly bushes, three old cedar trees lay tangled together, their branches overgrown with grass and heaped with weathered oak leaves. The Northwest gun’s muzzle pointed overtop of the brush heap. My thumb played with the flintlock’s heavy hammer. I checked the pan’s prime, then approached from the west, seeking an uphill shot. I saw no tracks, neither in nor out. “A perfect lair but no tracks,” I thought. With care, I rested my left moccasin on the outer tree’s barkless trunk and pushed down, shaking snow from the captured leaves. Nothing bolted. I stood quiet for a few minutes, then shook the pile one last time. Nothing. I turned about and saw that the tracks diminished a few oaks down the hill, before the sedge grass at the edge of the big swamp. I decided to walk to the swamp, then circle around the barberries on my return uphill, but the plan did not set well with my subconscious. I cogitated, as I sometimes do when I am unsettled with a given course of action. With deer season over, my attention turns to small game, cottontail rabbits in particular. I expect to chase squirrels a time or two more, but fresh snow, moderate winter temperatures and the discovery of a lone set of rabbit tracks bring a special woodland thrill to my heart. I suppose the excitement is in some respects a re-living of so many youthful lessons, taught by a host of educated cottontails. When the opportunity arose, I spent but a few minutes donning my 18th-century garb. All the while, violins fiddled “The Elk Hunt” theme from “The Last of the Mohicans” in a back corner of my mind. With the urgency of that melody, it didn’t take long to run a wet patch down “Old Turkey Feathers’” bore, check the English flint and slip the Northwest gun back into its leather case. But my shooting pouch was another story. Swelled with the obesity of excess, the bag’s contents exhibited a pitiful cross between that of a modern, black powder competitor and a period-correct, Lower Great Lakes hunter of 1794. In that respect, as a living historian, I am my own worst enemy for allowing the two worlds to mingle. So as not to delay the moment, I pulled everything from the shooting pouch and started anew. A hand-forged turn-screw and a small cylindrical brass oil bottle nestled in the bag’s lower seam. 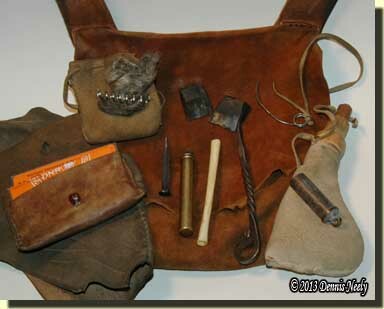 The leather pouch that hides my hunting licenses went in next, along with a small deerskin bag of flax tow and two wire gun worms. Two English flints and a wrought nail, filed round to fit the hole in the hammer’s jaw screw, made the cut, too. I put the greased leather cow’s knee over the contents in the bottom of the bag, much like a divider. A turkey wing bone always resides in the bag’s back crease; a priming wire, secured to the bag with a buckskin thong drops in the front. Because the late goose season was still on, I chose to load with bismuth shot that day, stored in a small stoppered pouch. And since I have not mastered measuring gunpowder into the palm of my hand, I included a brass charger. 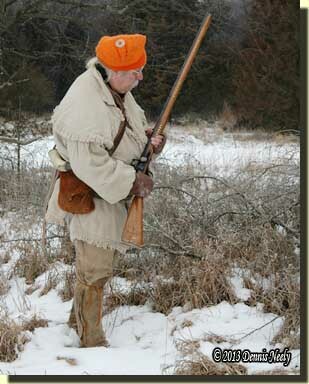 In today’s world, the time allotted to personal activities, like living history and traditional hunting, is limited. Therefore, I spend a large percentage of that time hunting, relative to target shooting. On those few instances when I enter a shooting competition, I simply load up shooting supplies in the pouch that I am most comfortable with, my hunting pouch, and that practice has to stop. A considerable difference exists between what I consider a “necessity” for match shooting and traditional hunting. The logical solution is two bags: one for competitive shooting and one for traditional hunting. I maintain a separate shooting pouch set up for the fusil de chasse that I sometimes loan out, and one for the T/C Hawken my son-in-law uses for muzzleloading season. Making and keeping a separate pouch for competition is not an issue, I just have failed to do that. As I stood cogitating on where to go next, a sudden burst of ice crystals clattered all about; snowflakes followed. A few steps away two small dead cedars lay crisscrossed amongst a few young barberries, where the cedar grove and hardwoods meet. Without thinking, I stalked those cedars, flexed the largest one with my left foot, then stepped back. A gray-brown flash of fur streaked straight away. The sear clicked. The buttstock found my shoulder. The rabbit skirted the bigger cedars, hopped left, hit a deer trail and passed behind a young oak. The turtle sight chased close behind. On the west side of the oak, the turtle caught the hare. White smoke engulfed the young oak. The bounding cottontail vanished. Ice pelted. Two quick steps to the left brought the rabbit back into view, laying in the trail, a hop or so ahead of the gray ruts in the snow that marked the death bees’ flight. 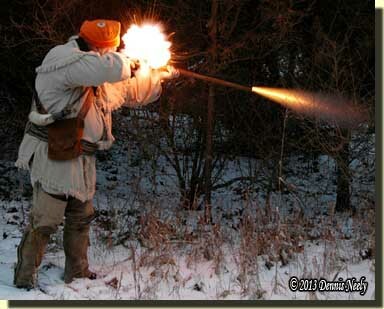 This entry was posted in Clothing & Accoutrements, Rabbit Hunts and tagged Dennis Neely, historical trekking, North West trade gun, Northwest trade gun, traditional black powder, traditional black powder hunting, traditional blackpowder, traditional blackpowder hunting. Bookmark the permalink. As usual, a wonderful read!